Why ‘Applied Learning’ is vital in project management? In the previous article, we touched on this subject and today we expand the discussion. The following is part of the SUKAD Applied Learning Program – Essentials (ALP-E). Project management is an applied domain and the best way to learn it is on the job by applying the concepts. Secondly, project management must be performed in teams, and not by an individual or an incongruous group of individuals. Most training programs depend on lectures and injecting knowledge. That knowledge is maintained until the exam, but quickly forgotten after, if not practiced on the job. Again, this is true even with generic certifications like the PMP (Project Management Professional) and PRINCE2. Unless those professionals who achieved these certifications are empowered to develop, or update, or enhance the Organizational Project Management system, then the return on investment from these training programs is reduced to a minimal. Most training, and in particular certification preparation (with the exception of the newly established PRINCE2 Professional), focuses on individual knowledge as the main requirement to pass the exam. Generic training often neglects the real life workplace dynamics in organizations, and often the techniques learned in class, even when participants buy into them, are quickly discarded by the work environment as wasteful and unnecessary. 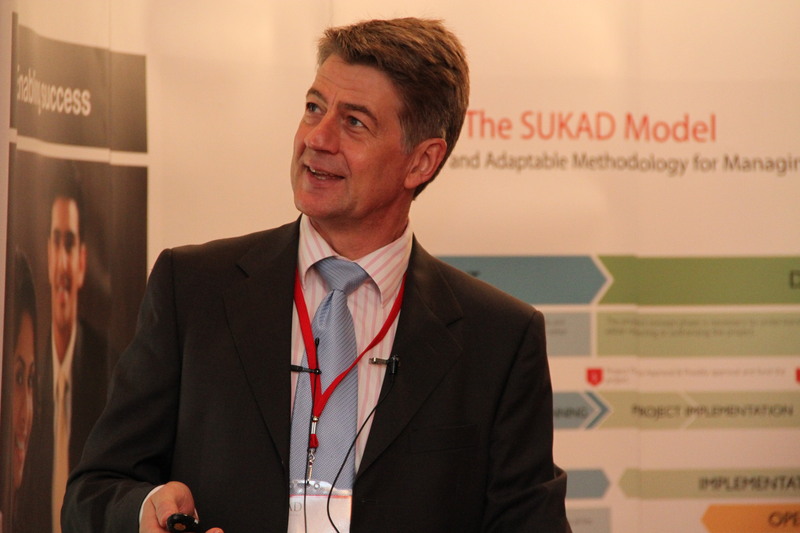 At SUKAD we believe that learning has occurred when behavior has changed for the benefit of both the organization and the individual. This means that the emphasis must be on creating shared workplace knowledge, leading to the formation of a collective mental model in a given environment. Such a model may include an organization specific OPM system, but also the tacit knowledge of which techniques should be selected and which team members are best suited to a particular project. if the program supplements the classroom work with on-the-job practice on a REAL project, working with a project sponsor, and a mentor/coach if available. In organizations where there is an established project management department or office, an internal mentor or coach would be helpful. However, if such mentors are not available, or the organization does not have a PM Department or PMO, then SUKAD Principal Consultant can fill that role. In either case, a sponsor, or project owner is necessary, and a real project would be preferred. In other words, if organizations want the prevailing culture to change, high-level support is necessary to facilitate such change, and real life scenarios are needed to ensure relevance of the learning. Contact us to learn about this program, or leave a message and will contact you! This entry was posted in Applying Project Management, Learning, Organizational Project Management and tagged Applied Learning, Competence, Education, Learning, on-the-job training, Training on 8 December 2016 by Mounir Ajam. Should organizations revisit how to learn project management? In this post, it is a mix between sharing knowledge and advertising our services. This entry was posted in Applying Project Management, Learning, The SUKAD Way and tagged ALP, Applied Learning, Learning, Master Certificate, Training on 26 November 2016 by Mounir Ajam. Is Management Education Still Educational? If someone would have told me a decade ago that I would at some time in my life be unhappy about a decline in the oil price, I would have seriously doubted that person’s sanity. Lower oil prices in a consumer economy not only lead to a direct reduction in energy prices, but also to overall cheaper consumer goods, due to their transportation component. So my somewhat singular view was that it must be good for everybody. But today I live and work in the United Arab Emirates (UAE), as I have for the past 7 years. Of course, UAE is part of OPEC, the Organization of Oil Producing and Exporting Countries and our economy depends to a large extent on our energy exports, so the lower oil price leads to less government spending and consequently a possible downturn in the local economy. This reminds me of the early 2000’s when I was working with a small project management consultancy similar to SUKAD in South Africa, an economy which is underpinned by its mineral resources, when the gold price hovered around an all-time low of around $260/Oz. Paradoxically, this period turned out to be our most successful one, when a large gold producer asked us to intervene and help turn their balance sheets around, notwithstanding the low gold price, by optimizing their project management processes, as mining is a strongly projectized business. I wonder if there is a lesson in this for us today. When times are good, we don’t seem to worry about improvement as much as when we feel the pinch. That’s human nature, so be it; but now is the time. I see this potential ‘downturn’ as a great opportunity to re-look at how we manage our projects and in general, our daily business. Capital projects are usually the first victims of budget cuts, because they are direct investments and unique, risky endeavors, but I’d like to start by widening the angle a little bit and look at management in general, as this often falls between the cracks of scrutiny. Make no mistake; project management is a management discipline, and a very particular one at that. But more and more organizations today also subscribe to OPM, or Organizational Project Management, in other words manage their day-to-day operations as projects and therefore increasingly rate project management as a core management skill. Dr. W. Edwards Deming once wrote: ‘our prevailing system of management has destroyed (the motivation of) our people’ and that we have to replace our system of quota with a ‘System of Profound Knowledge’. He elsewhere concluded that ‘in order to transform our prevailing system of management we have to (also1) transform our prevailing system of education, because they are the same system’. This link between management and education appears to be an original thought on Deming’s behalf, and it throws a very different light on management education, of which project management training is a substantial component these days. Add to that the fact that my eldest son started studying Business Administration this year and that I am less than impressed with the curriculum on offer, and you will see where this is going. I will start by reverberating Deming and state that we need to critically re-look at our management education system. Once I came to this realization I soon stumbled upon a book entitled ‘re-thinking management education’. This excellent work is a compilation of highly academic chapters on different aspects of management and management education, and I was sold when I read the introductory chapter by the authors. Since we’ve entered the globalization era – some say soon after the fall of communism when East and West truly merged – The global economy has become one single organism, where Europe and America sneeze when China has a cold. Or in more realistic terms, where a North American property slump led to a global financial crisis in 2009, or more recently where Russia and Iran suffer when OPEC refuses to cut oil production. In such a volatile global economy organizations have to be extremely agile and light-footed to survive and thrive. Furthermore our whole concept of economic value has changed yet again; just think about some recent market capitalization of social networks like Facebook and Twitter. In this environment it just doesn’t hold water that business schools only teach management techniques that are based on principles that were relevant a hundred years ago. This is exactly what French and Grey argue in the above-mentioned book: That management education is no longer educational in many instances, in that what is traditionally taught can no longer be meaningfully applied. They do argue however that management education is needed and should not be discarded but that it definitely needs a good critical look. To support this thesis they compare management to political science and conclude that most prominent politicians have never studied political science. It is more a science that is useful for political analysts than for politicians, but nevertheless a very necessary one. Business school, they argue, are too pre-occupied with promoting a single approach whereas good managers, like good politicians, must sense what the right approach in any given situation is. So the school should treat different views in a divergent way rather than converge on a single approach. This new view on management then also implies a new approach on management education: real-life problem solving, managing change and leading people should take preference over traditional academic lecturing. Practical and fleet processes are the tools, not lengthy analyses and stifling decision-making methods. Crisp delegation of authority and common understanding of practical processes are the order of the day. Sharing of strategic objectives down the ranks is utterly beneficial as it will focus delegated decision making, while keeping just the right degree of control. The good news is that these approaches exist in the form of project and programme management. We have known them in their current form since mid-20th century, and they have been successfully applied in many projects over the years; but I would argue that in management as a whole, we have not seen the need for them as we do now. Unfortunately, even in the realization that these new techniques gain relevance, the way they are taught has often not been scrutinized, and herein lies our challenge today: We need to critically re-think our management education. I am not saying we have not done anything. Smaller learning institutions and especially private training organizations have typically adopted a hands-on facilitating style for years; however the more established academic institutions are, even today, falling horribly short. We may ask then, why not earlier, as in the crisis of 2009? Because 2009 was brutal and abrupt and spread across the globe Gangnam style. Many organizations went into survival mode; many commercial entities didn’t survive. In today’s downturn, which is regional rather than global, and largely energy-sector bound, we have the perfect opportunity to streamline, optimize; in other words, projectize not only our work, but also our education. Today’s headline in the 7 Days UAE newspaper shouts in big letters: OIL IS HISTORY – EDUCATION’S THE FUTURE – Message form the Crown Prince of Abu Dhabi to global summit. Robert French and Christopher Grey, Rethinking Management education, SAGE publications, 1996. This entry was posted in Human Aspects of Project Management, Learning and tagged Education, Learning, Project Management Learning on 17 February 2015 by SUKAD Admin. Should you bother investing in project management ‘training’? This entry was posted in Applying Project Management, Organizational Project Management, Project Management Training and tagged Clients, Custom-Fit, Learning, Program Management, Project Management on 18 July 2013 by Mounir Ajam. Do you want access to case studies, presentations, ebooks on project management? This entry was posted in Community, Project Management and tagged 4Ds, 7Es, CAM2P, Knowledge, Learning, Portal, SUKAD Way on 27 June 2013 by Mounir Ajam. Is Entrepreneurship a Necessity for the Future of Developing Nations? This entry was posted in Entrepreneurship and tagged Development, Entrepreneurship, Learning on 12 December 2012 by Mounir Ajam.